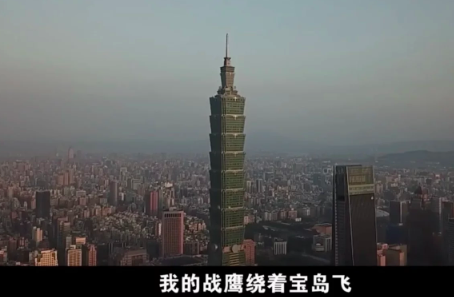 A scene from Beijing’s propaganda video superimposes the PLA logo against an image of Taipei 101, Taiwan’s tallest skyscraper. 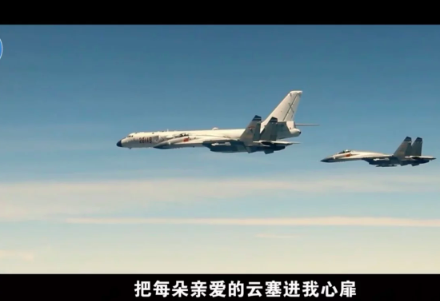 Beijing has released a "goodwill" Lunar New Year video message to the people of Taiwan that juxtaposes scenes of daily life in the self-ruled island with shots of fighter jets and bombers from the People's Liberation Army taking part in exercises. The film, titled My Fighting Eagles Fly Around Formosa - an old name for Taiwan, was published on social media by the PLA Air Force Airborne Corps on Sunday with a note saying it was to celebrate the new year, which fell on Tuesday. The 3½-minute propaganda film released on Weibo, China's Twitter-like platform, leaves little to the imagination as it superimposes the official badge of the air force against a shot of Taiwan's iconic skyscraper Taipei 101, once the world's tallest building. Despite the footage of H-6 bombers and J-20 stealth fighters, the film's official message speaks of reunification and brotherhood. Beijing considers Taiwan a breakaway province to be reunited with the mainland, by force if necessary. The lyrics of the song that accompanies the images call for "Brothers and sisters" from Taiwan to "return [and] reunite". "My fighting eagles are flying around Taiwan, the nostalgic memory from the homeland is softly calling you to return." As well as assorted images of Taipei 101, the film includes footage of other famous locations on the island, like Sun Moon Lake and Ali Mountain. Despite the footage of H-6 bombers and J-20 stealth fighters, the film’s official message speaks of reunification and brotherhood. Beijing has taken an increasingly hard line against Taipei since Tsai Ing-wen was elected the island's president in 2016. Tsai refuses to endorse the mainland's view that democratic Taiwan is a province of China. In response, the PLA has stepped up its military exercises in the air and on the water close to Taiwan, and staged war games on the mainland side of the Taiwan Strait. The defence ministry in Taipei responded to the PLA film by releasing a 90-second video of its own, titled Freedom Is Not Free, on Monday on Facebook. It includes images of the island flexing its own military muscle, with missile launches and drills involving its ground, air and naval forces, while an accompanying message says Taiwan's military is always ready for combat, even during the Lunar New Year holiday. Also on Monday, Taiwan's Mainland Affairs Council condemned Beijing for using the propaganda film to stir up ill feeling across the strait. "This approach aims at reunifying Taiwan with force and will have only counterproductive results as Taiwanese will find it repulsive and distasteful," it said.